Last year I received a Kindle for my birthday just before I left on a three week trip to Italy. It's funny, I would not have bought the device for myself but it really was the perfect gift since one of my greatest packing challenges is deciding how much reading material to bring. The Kindle came in very handy during a lengthy flight delay in Frankfurt and when I got snowed in Rome. There were great challenges in travel transportation last year, but having a Kindle made waiting tolerable. Faced with a 5+ hour delay in Frankfurt in January, I downloaded the 600 page Steve Jobs Bio and the time passed very quickly, plus I was thankful I did not have to lug around that beast of a book in print. 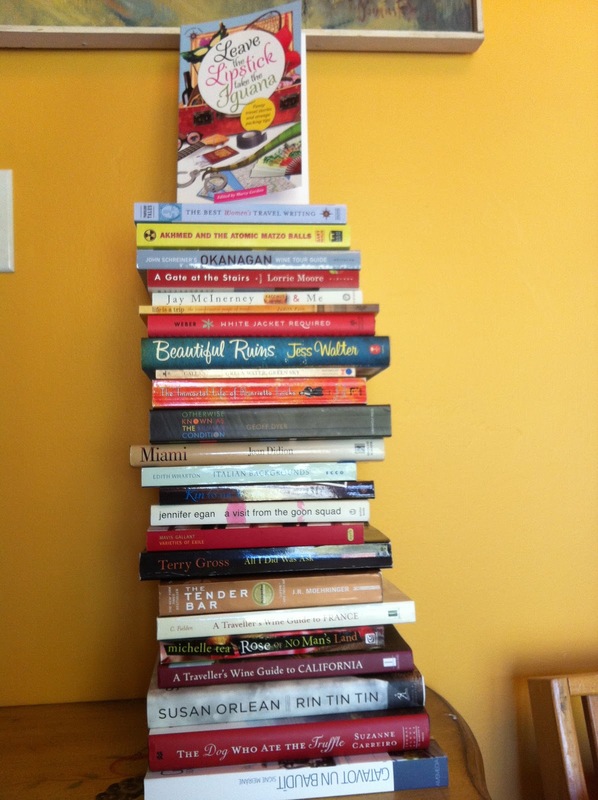 I love the portability of the Kindle when I travel, but miss having the hard copy books for my bookshelves. A few months ago I won a Kindle Fire--so now I have two Kindles and all the books on my first kindle show up on the Fire. Although I much prefer reading on the flat non-back lit screen of my first Kindle. Note to Publishers: I’d pay extra for a bundled print book that included all formats including audio, so I could read anyway I choose. 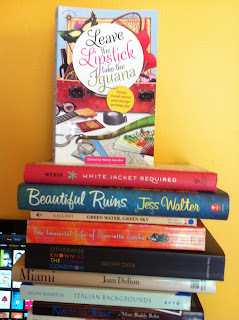 This year several friends published books, and my book, Leave the Lipstick, Take the Iguana, a travel anthology I edited, came out as well. 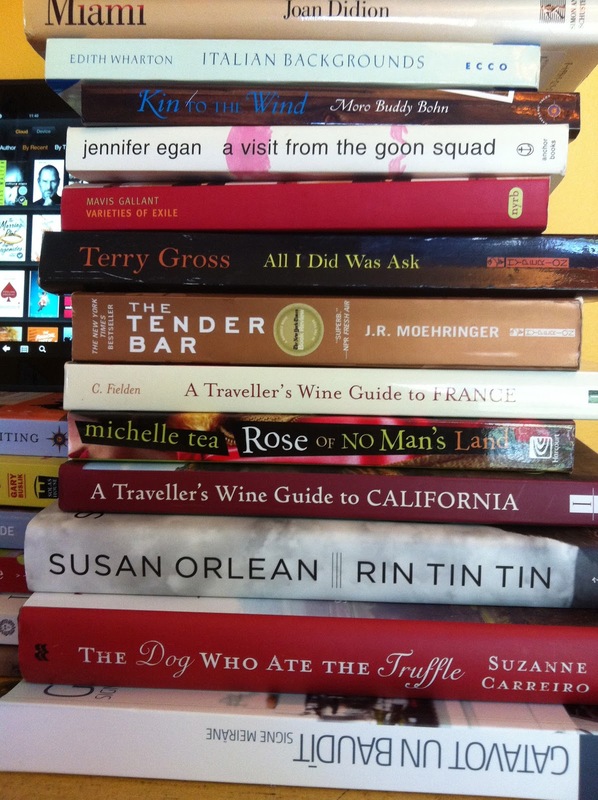 So cheers to all the readers, writers, and editors who make the world a better place to wait --especially in airports. Around the middle of May I downloaded The Financial Lives of the Poets by Jess Walter and spent two days glued to my Kindle reading it. This lead me to seek out more of his work and I also read Citizen Vince on my Kindle. But as soon as I as saw the cover for Beautiful Ruins, I knew I had to have the real thing. I’ve spent time in the Cinque Terre, back in the days before it became inundated with Steveites, and their guidebooks. I love having the actual book, and what a great satisfying read it was. I found the characters in Beautiful Ruins so strong that I had a hard time keeping them out of my mind as I read other books afterwards. Akhmed and the Atomic Matzo Balls by Gary Buslik -- This book will spin your head like Linda Blair in the Exorcist. Tell me...What did you read last year that was memorable and worth recommending? Let me know below. I’m always looking for a good read. P.S. 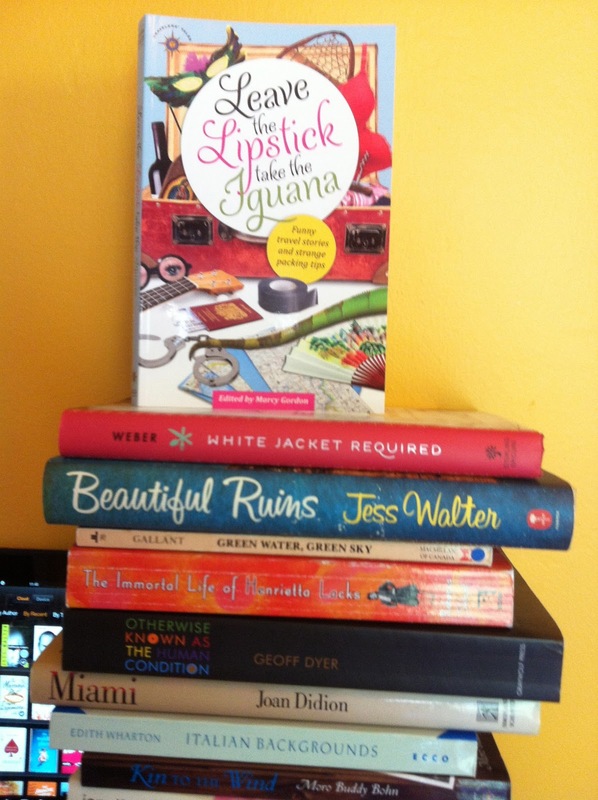 My Jess Walter jag is still waiting in the wings. Hope to get to him this year (including the forthcoming stories in "We Live in Water." Hi David --Thanks for your suggestions. I have “Glaciers" on my read next list. Will check out the others on your list. I also pre ordered “We Live on Water” -- looking forward to it. Love Jess Walters. If you want to keep the Walters jag going, The Zero is a great book too. My favorite book of 2012 was Gone Girl by Gillian Flynn-a twisted good time. Hi-- I have a sample of The Zero on my Kindle, want to get the book too. I’ve heard good things about Gone Girl, thanks for the reccomendation.